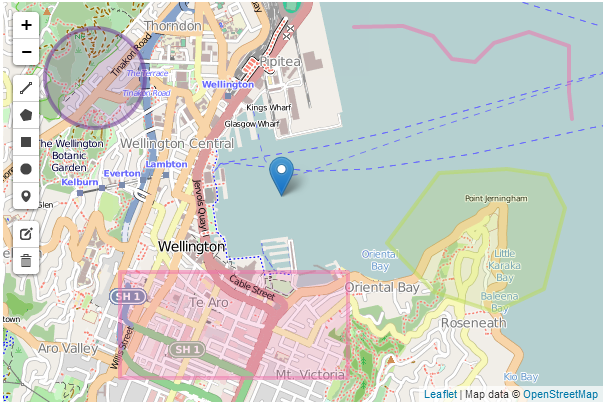 Leaflet.draw adds support for drawing and editing vectors and markers overlaid onto Leaflet maps. Its driving force is Jacob Toye (a good Hamilton lad, so he gets a special shout-out :-)). 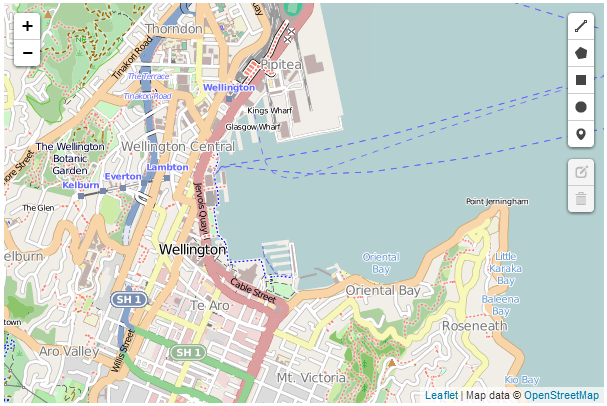 It is a comprehensive plugin that can add polylines, polygons, rectangles, circles and markers to a map and then edit or delete those objects as desired. It has an extensive range of options for configuring the drawing objects ‘look and feel’. It’s code is supported on GitHub and it can be downloaded from there. There is also some great documentation on function and use for the plugin that should be the authority for use. 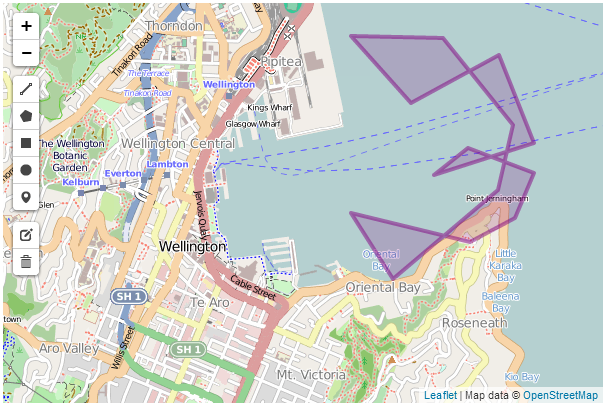 Leaflet.draw is less of an endpoint, than an enabler of additional functionality. 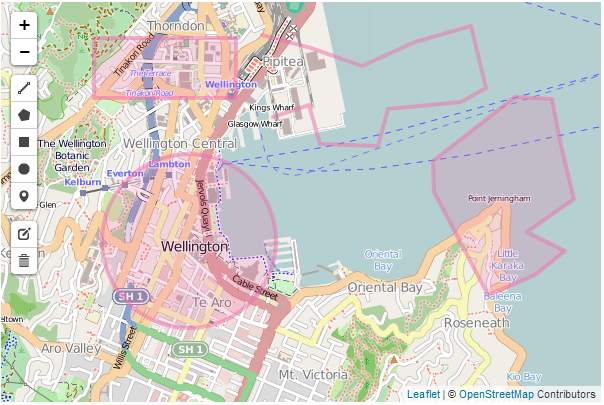 I say this because while it gives us the ability to draw to our hearts content on a map, it also provides the framework to take those drawn objects and push them to a database or similar (which we won’t cover in this overview sorry). 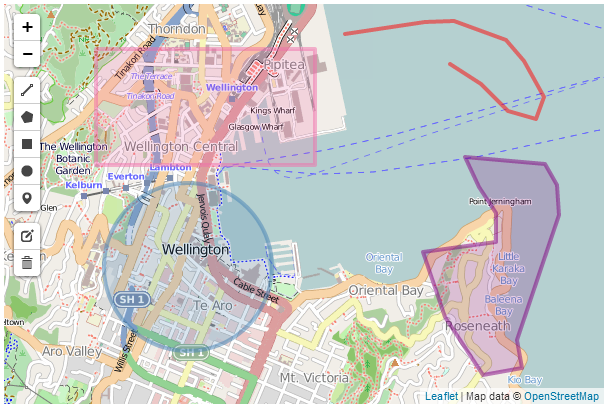 What we will go over though is how to add Leaflet.draw to our simple base map and how to configure some of the wide range of options. Here’s what we are aiming to show in terms of the range of controls and options on the left hand side of our map. And here’s some example objects produced with the plugin. The colours are configurable as we shall see in the coming pages. The following code listing is the bare minimum that should be considered for use with Leaflet.draw. I even hesitate to say that, because the following is really only suitable for demonstrating that you have it running correctly. The configuration options that we will work through in the coming pages will add considerable functionality and will be captured in a separate example that will be available in the Appendices and online on GitHub. This loads the file directly from the Leaflet.draw repository on GitHub, so if you are loading from a local file you will need to adjust the path appropriately. The second is the block that loads the leaflet.draw.js script. 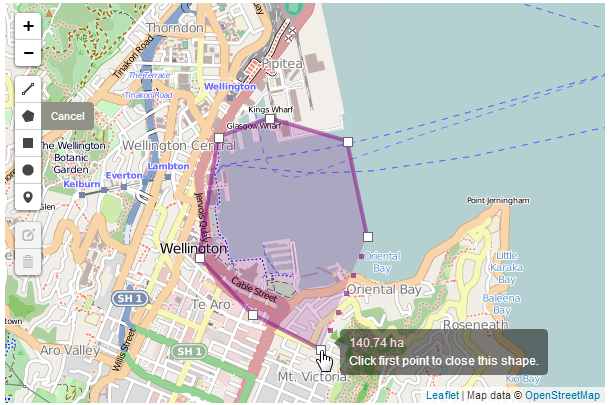 The var drawnItems = new L.FeatureGroup(); line adds a new extended layer group to the map called drawnItems. This is the layer that the elements we create will be stored on. Then the map.addLayer(drawnItems); line adds the layer with our drawn items to the map. This is required when adding the edit toolbar and tells the Leaflet.draw plugin which layer (drawnItems) should be editable. Then the controls are added to the map (map.addControl(drawControl);). 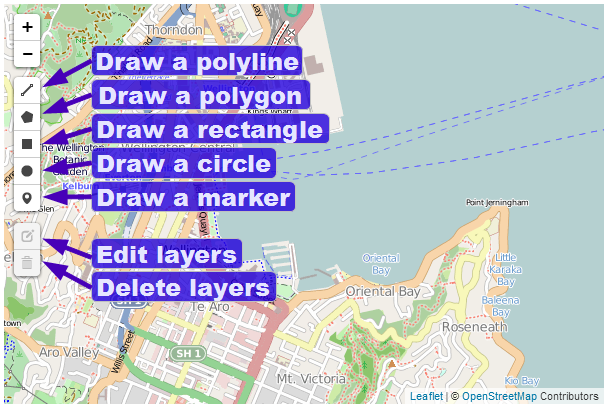 Finally when we add a new vector or marker we need prompt a trigger that captures the type of item we have created (polyline, rectangle etc) and adds it to the drawn items layer on the map. This is alto the part of the code where you could store the information that described the element in a database or similar. As I mentioned earlier, the sample code described above is extremely cut down and should be extended using the wide range of options available to Leaflet.draw. As our first change, if we use the simple example, all of the elements we generate have the same colour, so lets change that first. Changing the options is a simple matter of declaring them when we initialize the draw controls by adding them as required by the documentation on the Leaflet.draw GitHub page. For example in the following code snippet we have added in the draw: option which in turn has options for each of the shapes. We have entered thepolygon: option which has it’s own options of which we have added shapeOptions: as an option. And as if that wasn’t enough we select the option for color: from this and finally declare it as purple. We can see that not only is a warning raised, but the shape colour changes. This has introduced the allowIntersection option and set it to false and provided the drawError option with the instructions to change the colour of the object to orange for 1000 milliseconds. This option will also work with polyline objects. 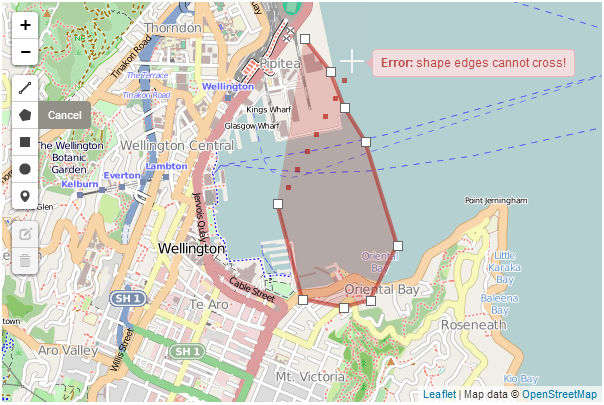 While tracing a polygon we can get Leaflet.draw to report the total area spanned by the shape by setting theshowArea option to true. By default once we have finished drawing a polygon, if we wanted to draw another, we would need to click on the polygon tool on the toolbar to start again. But we can use the repeatMode set to true to continue to dray polygons until we select another object to draw or until we press the escape key. This option will work with all the other drawing objects. If an alternative marker has been declared (see section on setting up different markers) it can be specified under the marker option as an alternative icon. 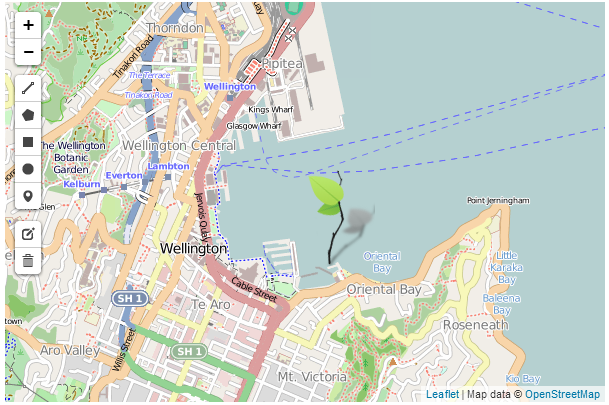 Here we are using one of the markers (the green leaf) set up as part of the custom icons tutorial on GitHub. And here’s a pretty picture of the green marker. The other options for positioning are bottomright, bottomleft and the default of topleft. The full code and a live example of the use of the Leaflet.draw plugin with the options described here in the appendices and is available online at bl.ocks.org or GitHub. A copy of all the files that appear in the book can be downloaded (in a zip file) when you download the book from Leanpub.